Summary : Green tea and jasmine? You bet! This tea from the Dragonwater Tea Company (now out of business) is a wonderful tasting and aromatic tea that combines perfectly the best of green tea with the best of jasmine. Review : Yeah...I'm a guy. But I must have a feminine side lurking in me somewhere as I seem to have an incurable need to try out "flowery teas." In particular, jasmine teas...the ultimate in flowery teas. I suspect this need also arises due to living in Nevada...which is a far cry from the flower capital of the world...and so I must get my flower fixation through tea instead of picking up the real things. This does have one side benefit, admittedly...I don't have to worry about picking up a rattlesnake while searching for flowers. And since I hate snakes...this is probably a good thing. And so it was, with a Sierra Snowstorm blowing in...and with spring seemingly forever away...my feminine side came out and I was suddenly in the mood for something that tasted and smelled like a flower. So I dug through my teas and the first one I picked out was a Jasmine green tea from the Dragonwater Tea Company (now out of business). I was especially intrigued by this tea from the Dragonwater Tea Company (now out of business) because this tea is a green tea, not your typical herbal creation. I liked this since you get your healthy antioxidants with this tea...all the while...hopefully...avoiding the grassy flavor found in straight green teas. This tea contains the following ingredients : Special grade Chinese green tea scented with Jasmine blossoms. Note...the jasmine is NOT infused into the tea. Instead, jasmine flowers are simply grown around the green tea leaves...and as the flowers bloom...the flavor goes into the tea leaves. So call it a "natural infusion" if you will. By my own admission, I was just a bit disappointed by the aroma of this tea. Dragonwater has some superb quality teas...and I was fully expecting to pop open the pouch and be greeted by the very powerful aroma of jasmine. But it was not to be. As such...my heart sank a bit. But alas...just goes to show you what little I know. Once brewed this tea comes alive...and the powerful scent of jasmine makes it happy and most welcome appearance. You see, one thing I love about jasmine teas is that they are just terrific smelling teas. You can get as much enjoyment from the delightful, flower garden fragrance of the tea as you can actually get from drinking it. I mean...who doesn't love the aroma of a summer flower garden? Now, the aroma wasn't quite as strong as some jasmine teas I've had...but it was more than strong enough to meet my needs on this snowy and stormy night. Still, if you are searching for the most powerful jasmine teas on earth in terms of fragrance...you may be a bit disappointed with the teas fragrance as it will be weaker than you probably expect. But then, of course, there is the teas flavor. What does it taste like? Simple...the perfect mix of green tea without the grass and the delightful flavor of jasmine flowers. Ideal. Perfect. This tea simply has a perfectly blended flavor to it...not too strong of a flavor of either the green tea and a very strong flavor of jasmine...allowing the best of both flavors to come out while keeping the grassy flavor of green tea happily in hiding. Overall, if you love jasmine teas...give this great and tasty green tea from the Dragonwater Tea Company (now out of business) a try. And if you are sick of grassy green teas and want to try something different...then this tea makes for a great starting point. Recommendation : Absolutely. This tea will be adored by anyone who loves jasmine teas, whether that be jasmine herbal teas or jasmine oolong teas. And if you want a break from the grass found in green teas...this tea will be a most welcome treat too. 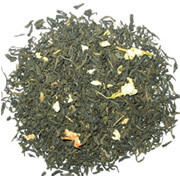 Mighty Leaf Tropical Green Tea : An absolutely delightful green tea...full of tropical flavors!